Taste of Dallas is a food and culture festival with a long, proud history. 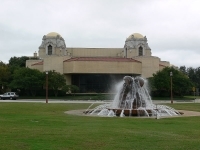 Not only can visitors sample culinary delights prepared by Dallas' top chefs, but the festival's new venue, the air-conditioned Fair Park, also stages a myriad other sights and activities, such as live music performances, visual art exhibitions, kid's events, shopping markets, and more. Taste of Dallas is one of the most important cultural events of any Texan's year - indeed, nearly 3.5 million satisfied customers have passed through its gates over the last 26 years. There is a special separate Kids' Tasting Town, where children get a chance to have their own cooking demonstrations, meet some of their favourite cartoon characters, get up close and personal with animals at the petting zoo, and more. Festival-goers pay a daily admission fee and then go through the exhibitors, all top chefs and restaurants in the area cooking and offering tasters of their dishes. Tasters are bought for minimal amounts, and in this way festival-goers get the chance to taste offerings from a wide variety of chefs and restaurants. Drinks are also available for sale at the festival, including wine, beer, cocktails and soft drinks.